We are all familiar with James Corden in the UK as he is amongst one of the funniest comedians and actors we have. The Hillingdon born star who is notably famous for starring in BBC One’s Gavin & Stacey has had a huge range of success since then. The 37 years old tv host recently sat down with heat radio and spoke about his personal life and his friendships he has established within the entertainment industry. 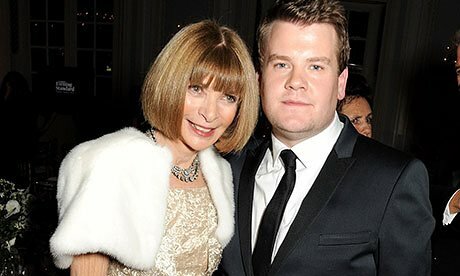 One friendship that comes as a surprise is his bond with the Editor-in-chief of Vogue, Anna Wintour. Lifestyle.one reports in his candid chat, James told us he’s in regular contact with US Vogue editor Anna Wintour, “We used to go for lunch every month when I was doing a play in New York,” he told heat, “ I speak to her fairly frequently. I just really, really like her. We get on very well and she’s amazing and incredibly supportive.” It’s rather nice to hear about two stars from different spectrums of the entertainment industry catch up so often with one another. How nice is to know that he had such support behind him and as a result we have a great talk show. The Late Late Show first came to screens in September 2014. To add to his success in June 2015 Corden received an Officer of the Order of the British Empire (OBE) from Princess Anne at Buckingham palace for his services drama. We can’t wait to see what amazing projects James has in store for us this year.